Released from AGM DISTIBUTOR LLC, the AGM30cc gasoline engine shows a great performance when installed on different model RC airplanes. More than thousands RC players have bought this engine from AGM’s online stores. 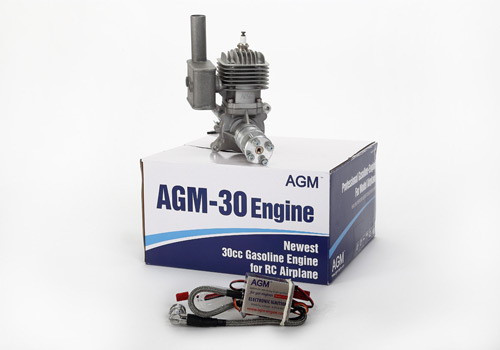 AGM 30cc engine is a small gasoline engine specially designed for RC model airplanes, with the displacement of 30cc, this engine can get to a horsepower of 3.7hp/8500rpm and the idle speed is able to reach even 1600rpm/min. Using a walbro carburetor and rear carb, auto advancing electronic ignition, and CM6 style spark plug, this engine can be installed on RC airplanes wingspan ranging 72-74 inches. To know whether an airplane gasoline engine is suitable for your model airplane, you should first make sure that the weight and size of the airplane, and then use the probable prop to support the airplane fly in the air. Of course, the diameter and stroke of the gasoline engine, the ratio of compression and lubricating capacity are always important. Meanwhile, the weight of the engine cannot be too heavy to affect the airplane’s performance. Normally, we recommend RC players to choose the engine with strong power and match well with their model RC airplane to get the best experience. And the quality of the engine also should be great and fight with the strong wind and other elements to make your flying steady and strong. For most of RC hobbyists, AGM30cc gasoline engine no doubt to be a good choice due to it combined the best advantages and also affordable for them.